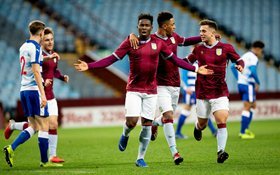 Aston Villa are through to the next round of the FA Youth Cup after thrashing Reading 4-1 at Villa Park on Tuesday evening. Dutch-born Nigerian attacker Colin Odutayo, who is making an impression this season, was too hot for The Royals to handle and netted the opener when he fired past Andresson after 13 minutes. Moments later, Odutayo picked up a loose ball before crossing for Jacob Ramsey, who doubled the advantage. The 17-year-old is Aston Villa's most clinical striker in the U18 Premier League this season with 6 goals from 12 appearances and has also appeared in five games for the U23s in the Premier League 2, a sign he's really making good progress at Vilal Park. A former Netherlands U15 international, Odutayo was signed by Villa from Racing Genk in the summer of 2017. Aston Villa's reward for beating Reading is a meeting with either Bournemouth or Oxford United in the fifth round of the FA Youth Cup.